Karon Sky House is ideal for seeking budget accommodation but also appreciating quality service, conveniently located just a short walk from the centre of Karon and the beach. An ideal setting close to the town and beach, yet in a quiet area. All rates are on room only (Breakfast not included). All rates are inclusive Government Tax 7% and service charge 10%. Children under 12 years old sharing bed with parent no charge. 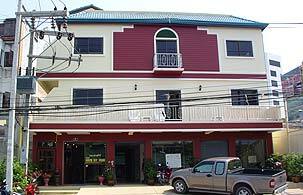 All rates are quoted in Thai bath and are subject to change with out notice.